You can always change the type of SSL certificate on your domain to a Let's Encrypt or Sectigo certificate within the panel. To the right of your domain, click the Settings button. The current certificate displays on this page. To the right, click the Add New Certificate button. On this page, select which type of certificate you'd like to change to. 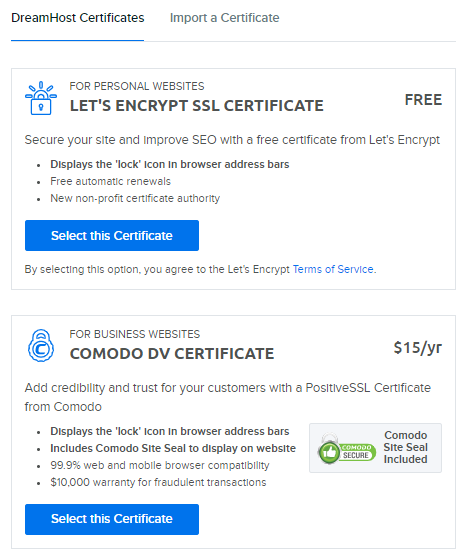 View the following articles for further information on Let's Encrypt and Sectigo certificates. How do I add a free self-signed SSL certificate? Even after you have added the SSL certificate to your site, visitors will not be able to use it unless they manually type in 'https' before your domain name. This defeats the purpose of adding it in the first place since the certificate is meant to protect all of your website traffic. There are several ways to fix this. View the following article for instructions on how to create a configuration file to redirect all visitor traffic to the secure version of your URL (https). Redirecting to the HTTPS version of your URL only works for the same domain. This means that you can only redirect from http://example.com to https://example.com. Is it NOT possible to redirect to a different domain. For example: http://example1.com to https://example2.com would not function with a 'Let's Encrypt' certificate. Article last updated April 08, 2019 21:22 PST.